Posted May 23rd, 2014 by admin & filed under Uncategorized. Practice. Practice. Pray… and practice. Mike started his voiceover career in Los Angeles. Attending a voiceover workshop (or two) is a key part to cracking the nut. Solid vocal range and a good home studio are a must, but persistence and patience are perhaps part of the best tools of the trade. Yes, take a voice workshop, and even consider having the director cut your demo or refer you to someone with a good ear. The best advice for perfecting your craft? Keep it real and adapt. The industry changes almost daily. New sounds, new styles, new creative producers with fresh direction are added into the casting calls by the minute. So listen closely to the commercials on Pandora, yes – radio commercials and TV commercials too, and even those “in-store” voices you hear while you shop… then, practice everywhere you go. You can even pretend you’re on the phone working on a style to dial in your craft. Once things get rolling, you’ll have to answer the big question: what to do with your time in between jobs? If you’re busy enough with voiceover, whatever you want. If not, keep on adapting… and praying. 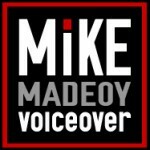 Mike is an American male voice talent with a wide range for your voiceover project. His styles include: friendly, regular guy next door, younger, older, mature, edgy, characters and announcers aged 20’s, 30’s, 40’s, 50’s, 60’s, and beyond. A full broadcast quality studio is a must and Mike offers his clients pro level audio gear with an Avalon 737 mic-pre, a Sennheiser 416 microphone, and a Telos Zephyr X-Stream ISDN box. Mike can be heard coast-to-coast and around the globe with strong clients in Atlanta, Chicago, Denver, Seattle, Honolulu, Los Angeles, New York, Salt Lake City, Pittsburgh, Cleveland, Milwaukee, Las Vegas, Turkey, Singapore, Denmark and all points in between. Clients include: Microsoft, Yellowfolder.com, Car Toys, Sherwin Williams, Coca-Cola, Pop-Cap Games, Ridgid Tools, Xbox, T-Mobile, Nautilus, and Lego.